In the southwestern and southern regions of Shandong, the ongoing rural revitalization campaign has been encouraging more locals to explore the economic value of many intangible cultural heritages, such as claborate-style paintings, wooden folk carvings, Langya straw weaving and the making of erhu (a two-stringed bowed musical instrument). With the help of "e-commerce + " strategy, a large number of cultural and industrial projects have been formed in the anti-poverty drive, creating more jobs and income for the poor. 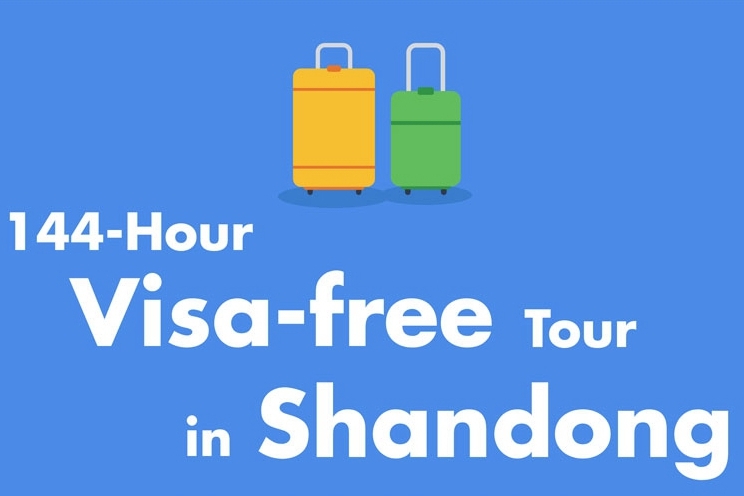 Shandong is currently working hard to deepen its poverty alleviation drive using cultural means. At a campaign meeting on the promotion of rural revitalization with cultural means, Wang Lei, head of the provincial cultural department said that the province has successively issued a "Problem-Solving and Implementation Plan on Poverty Alleviation With Cultural Means in Shandong", a "Three-Year Work Plan of Winning the Anti-Poverty Battle Campaign (2018-2020)" and a "Special Cultural Plan on Relocation and Reconstruction for Residents from Yellow River Flood Lands", specifying the assignments, roadmap and schedule for the targeted anti-poverty campaign using cultural means. Recently, a group of reporters joined an "Interviews on How Intangible Cultural Heritage Helps Poverty Alleviation Tour" hosted by the provincial cultural department of Shandong, successively visiting Cao county, Dingtao district, Juye county of Heze city and Tancheng county and Junan county of Linyi city to learn about the achievements of targeted poverty alleviation with cultural means and find out more about how much intangible cultural assets have contributed to the anti-poverty drive and rural revitalization campaign. 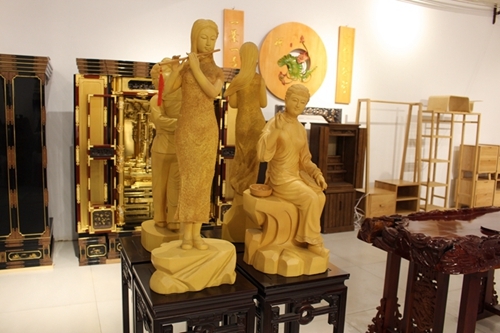 Cao county wooden sculpture is one of the intangible cultural heritages certified by Shandong province. To pass it down, locals are employing an approach of "from skilled masters to apprentices". With preferential policies towards the poor, members of poverty-stricken families will be considered first for jobs in this area. By joining a trade, one can earn at least 3,000 yuan ($437) per month. 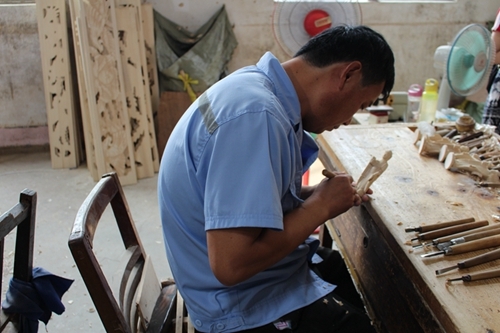 In the workshop of Yunlong Wooden Sculpture Company Limited of Cao county, over 30 craftsmen were seen making and sculpturing, polishing and shining their products to prepare for the upcoming large orders from the "Double 11" shopping season. "Wooden sculpture is a labor-intensive industry. It increases employment effectively. Farmers get more income with it and that's how targeted poverty alleviation is achieved," said Cai Xiufang, an inheritor of Cao county wooden sculpture. The wooden sculpture company in Sunlaojia county now employs more than 800 people, including 460 women and 80 handicapped people. Fifty workers are from households relying on subsistence allowances. Juye county of Heze city, known as "the hometown of Chinese farmer's painting", has been focusing on the painting and calligraphy industry in its revitalization strategy to expand the influence and popularity of claborate-style peony painting nationwide. 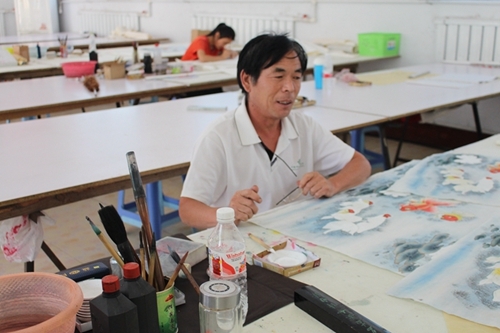 Thirty-year-old Wang Jufeng is a farmer painter at Juye county's Luxi Painting and Calligraphy Institute. She began learning claborate-style painting two years ago. She can now draw vivid peonies and magpies. She finishes a painting every week and sells her works on an e-commerce platform all over China. Demand is high but supply is short. According to Xu Fengqiu, a member of the Shandong Artists Association and vice dean of the Heze Peony Painting Academy, Juye county's Luxi Painting and Calligraphy Institute has been a training base, employing a method of "intangible cultural heritage + employment workshop". The institute invites professional teachers from painting schools, experts and skilled members to supervise and train the new members. Students from the poverty-stricken families are recruited first, and the training for them is free. The aim is to get them out of poverty. "Farmers will receive training for half a year for free and then they can paint. Normally they will earn from 3,000 to 4,000 per month," added Xu. Miaoshan town of Linyi city's Tancheng county has turned to two intangible cultural heritages: Xuezhuang wicker weaving and erhu making. The town has been exploring a development mode combining Intangible cultural heritages with cultural industry development, construction of a beautiful village and all-area tourism targeted at poverty alleviation, continuously promoting intangible cultural heritage-related cultural industries. In the meantime, the town hosts training in how e-commerce supports intangible cultural heritages to encourage craftsmen to open shops online and expand the market for their products. About 10 kilometers away from Miaoshan is Shengli town, where farmers grow Langya grass. Farmers making handicrafts from woven straw is a long tradition. The technique of weaving Langya straw has been certified as an intangible cultural heritage by Linyi city. Fifty-year-old Yan Bingxiu has been weaving Langya straw for more than 30 years. According to her, the local government employs a poverty alleviation mode of "enterprises + branches + workshops + poor families". Enterprises are encouraged to employ the poor and reach more poor people by contracting with workshops, supporting the villagers' struggle to escape poverty. In 2018, Shandong continues to support 1,000 intangible cultural heritage artists and craftsmen to train more apprentices and pass their craftsmanship along. Today, there are more than 1.1 million enterprises or business units of various traditional crafts in the province. 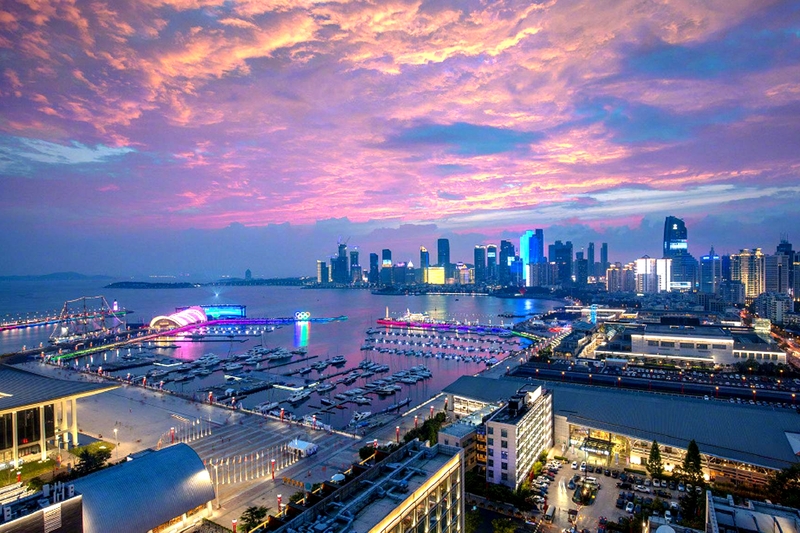 Their annual revenues reach 126,736 billion yuan and generate 13.56 billion yuan in taxes. The industries employ more than 3 million people; over 400,000 of them are from poor households.